French and Austrian radical right-wing leaders have recently declared that the EU should not interefere in Ukraine's national sovereignty. Some may consider these statements as a spit in the face of the Ukrainian radical right-wing Svoboda party, which today supports Ukraine's European integration, but in fact these statements reveal a bigger picture. Despite the widespread beliefs that Svoboda is "the only non-EU member of the Alliance of European National Movements - a group that includes the BNP and French National Front" (you will find this incorrect statement in a recent amateurish report on Channel 4), neither Svoboda nor the French National Front is a member of the Alliance of European National Movements (AENM). The National Front left the AENM in 2011 after Marine Le Pen became president of the party: the AENM was too extreme for Le Pen who decided to re-imagine the National Front. Svoboda was never a member of the AENM, but enjoyed only an observer status (as a non-EU party), but was stripped of this status in 2012-2013. The major force behind the expulsion of Svoboda from the AENM was the Hungarian extreme right Jobbik party, and one of the main reasons why Jobbik did this was the party's pro-Russian leanings. Earlier this year, Jobbik's leaders (Gábor Vona and Béla Kovács) visited Moscow and met with Russian fascist Aleksandr Dugin who is notorious for his anti-Ukrainian sentiments. In Moscow, Jobbik even went so far as to declare that it would be better for Hungary to join the Russia-dominated Eurasian Union should occasion arise. The Eurasian Union which Russia wants Ukraine to join when this political structure comes into being in 2015 (the Customs Union is a precursor to the Eurasian Union). Svoboda, known for its anti-Russian and anti-Eurasian positions is, thus, an enemy of Russian fascist imperialists and their extreme right accomplices in Europe. However, Kovács and Vona were not the only ones who visited Moscow recently. So did Marine Le Pen: in June this year, she met with the Duma Chairman Sergey Naryshkin and Deputy Prime Minister Dmitry Rogozin. Rogozin is a former Russia's ambassador to NATO (2008-2011), and it was during his service as a head of the Russian Mission to NATO that Ukraine and Georgia were denied membership in this organisation. Rogozin was also a joint leader of the Russian extreme right Rodina party, along with Sergey Glazyev. 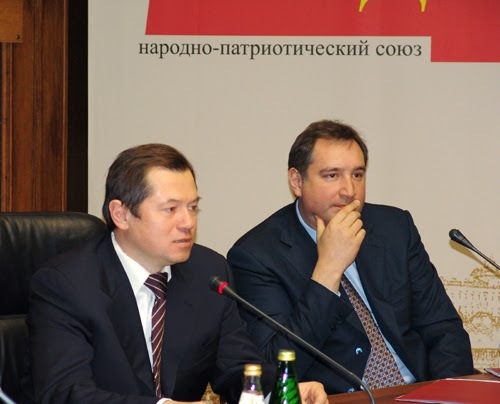 In July 2012, Glazyev was appointed an advisor to Vladimir Putin on the issues of political and economic integration in the post-Soviet space (Customs Union and Eurasian Economic Community). It was Glazyev, who threatened that if Ukraine were to sign the Association Agreement with the EU, "Russia could no longer guarantee Ukraine's status as a state and could possibly intervene if pro-Russian regions of the country appealed directly to Moscow". What unites Russian fascist imperialists and the French - and European - far right? Their unity is strategic and ideological at the same time. Putin no longer trusts European mainstream politicians - be they conservatives or social-democrats, as they will always criticise Russia for the violation of human rights and fundamental freedoms. But since the European far right now seems to be on the rise, Putin came under the impression that European far right parties might gradually take power in European societies, and then Russia would not have image problems in the EU. This does make sense as the European far right shares Putin's attitude towards human rights and would be ready to emphasise "the legitimate interests of Russia" in the post-Soviet space, as the Andreas Mölzer from the Freedom Party of Austria already does. There will be "no" electoral fraud in Russia either: on the contrary, Russia will be highly praised for "a robust, transparent and properly democratic system", while Putin himself will be hailed as a hero who "has managed to steer the post-communist, crisis-ridden Russia into calmer waters" or, as the Norwegian extreme right terrorist Anders Breivik wrote, "a fair and resolute leader worthy of respect". Putin has already become a hero for the European extreme right. 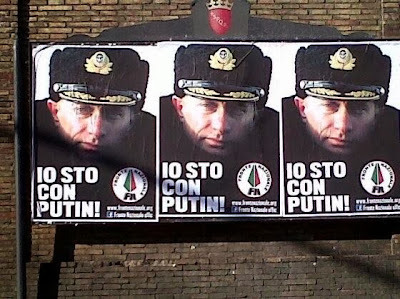 The Italian National Front, for example, applauded Putin for his anti-gay laws and the disruption of the US/European plans to crack down on Bashar al-Assad's regime. One of my French sources says that the Russian authorities provide financial support to the French National Front. No matter whether it is true or not, it is evident that Russia is increasing its presence in European societies and this presence is often linked to the European far right. 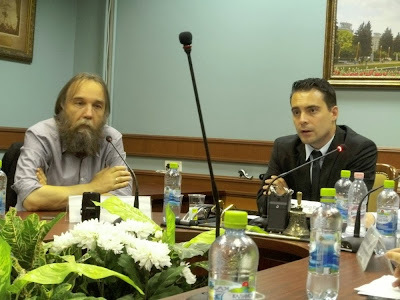 For example, one of the founder of the France-based ProRussia TV is Philippe Milliau, a former member of the New Right GRECE network, which has been closely linked to Aleksandr Dugin's movement since the early 1990s, the TV broadcaster's Director, Gilles Arnaud, is a former National Front councilor in the Upper Normandy, while another journalist of ProRussia TV, Alexandre Ayroulet, is a former leader of the Youth National Front. 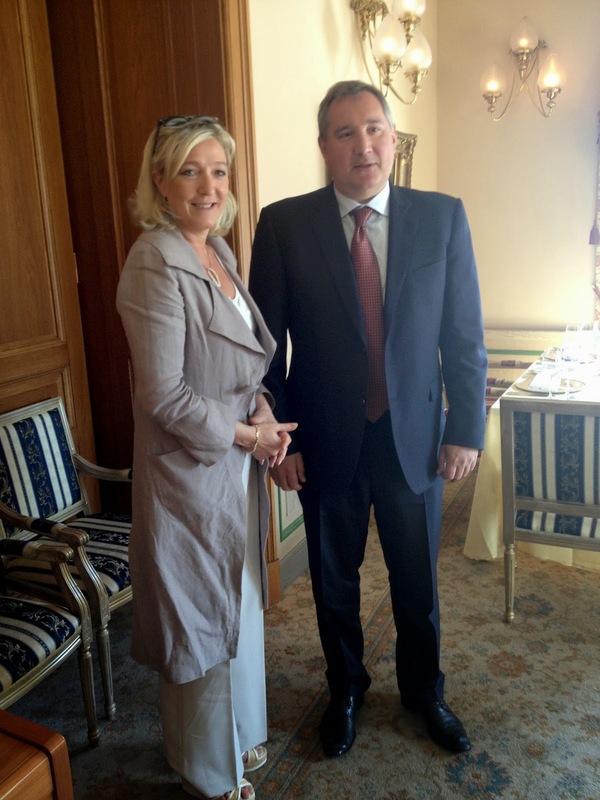 Mölzer's and Le Pen's calls for the non-intereference in the "Ukrainian sovereignty" are only a tip of the iceberg of the collaboration between Russian imperialists and the European far right. The "Ukrainian question" may not be the most important aspect of this bigger picture, but if the EU loses Ukraine, it will be implicated in making the European extreme right even stronger. Se also "Re-organisation of the Ukrainian space", or Putin's agents in Ukraine. I read your article with big interest because it proofs striking how Russia is becoming a fix point in geopolitical and (partly) ideological considerations of far right / fascist groups. Some weeks ago Dugin contacted the party leader Michaloliakos in his cell and requested (according to GD) to open a channel of communication between the Greek fascists and his think tank. Michaloliakos also gave an interview to the newspaper 'The Voice of Russia' where he stressed that Russia is the only alternative to the countries decay. Last but not least a party deputee participated in a conference in Moscow and strengthened the ties to Russian nationalists that were distinct for long time and also revealed in various solidarity actions for GD in Russia. Yes, I read that Dugin had written a letter to Michaloliakos (http://xaameriki.wordpress.com/2013/11/14/top-russian-advisor-aleksandr-ntougkin-communicating-with-n-g-michaloliakos-via-letters-defencenet-%CE%BF%CE%B9-%CE%B5%CF%80%CE%B9%CF%83%CF%84%CE%BF%CE%BB%CE%AD%CF%82-%CE%B1%CE%BB%CE%B5/), but I did not know about Michaloliakos' interview to the VR or Russia being explicitly mentioned in the GD's programme. This is very interesting indeed. If you have relevant links, let me know. Thanks! I've received your message. Самое во всем этом любопытное, что, развивая контакты с ультраправыми Франции, Австрии и Венгрии, московские власти пугают население страны "Свободой", хотя, если соблюдать последовательность, именно украинские националисты и должны быть "близкими" партнерами. is your source french ? I am very interested by this assertion. One of my sources is French.